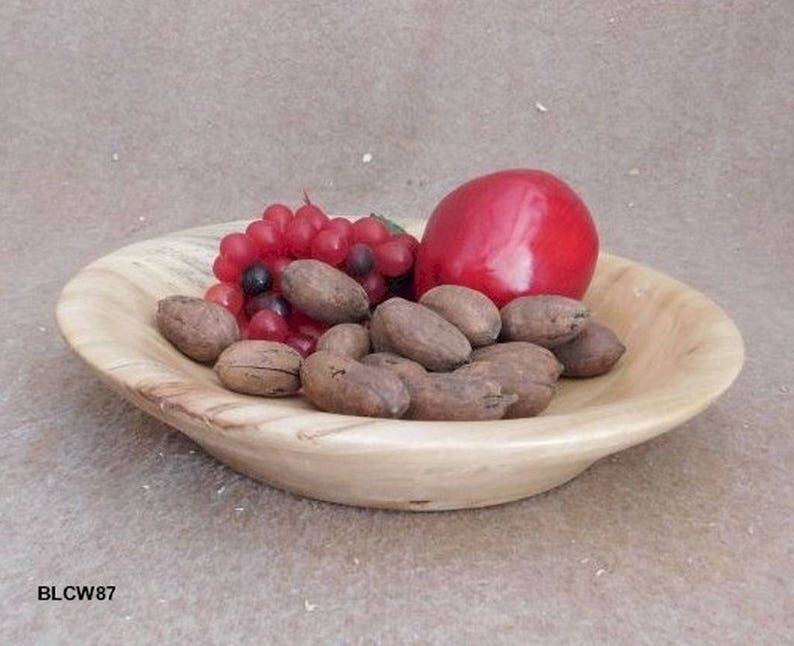 Are you looking for a medium sized wood bowl that would look really good on your table as a centerpiece? Then you really need to consider this tasteful and warm looking cottonwood bowl. Not overly large as the diameter is 11” with a height of 2” and a depth of 1 ¼”. But, it does hold 5 cups of liquid measured to the brim of the bowl! One other consideration for this bowl is that it is lightweight. I have not put it on the scale but I can’t picture it weighing over 2 pounds. The natural colors of this wood make it a favorite with a lot of people. The wood was first sealed with food grade walnut oil and then finished with a walnut oil/shellac mix. This combination gives the bowl a nice hard long lasting natural finish. I mixed the finish where there was just enough shellac to give the bowl a bit of shine, but not overly so. This way you can still feel the grain of the wood. 25Nov17 BLCW87 Free shipping within Continental United States only.